JRSC Automatic Tensioner - Miata Turbo Forum - Boost cars, acquire cats. Supercharger Discussion For all you misguided souls. Anybody done a automatic tensioner setup for an m45 or mp62? 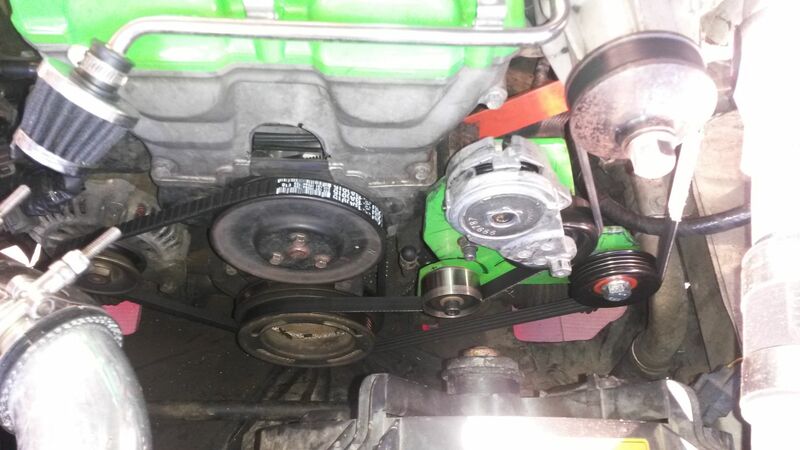 Was thinking of using a tensioner from a Nissan Sentra circa 2008... look like it might work and I think (from the picture) it works in the direction I want... (CCW). Have to confirm after work. Any reason a manual tensioner would be better? Do the automatic tensioners generate enough tension? Do they vary? I find that the TDR tensioner with PS and AC delete is a fantastic solution. I run a 62.5 snout and get very little orbit and no slip. I do run a high grade ( TS type 5) recirc with a light spring, but no bypass. Any opinions on which side of the system my tensioner is on? Someone is suggesting I put it on the wrong side - "tight side" vs "loose side" due to the direction of rotation of the belt. I like your idea. 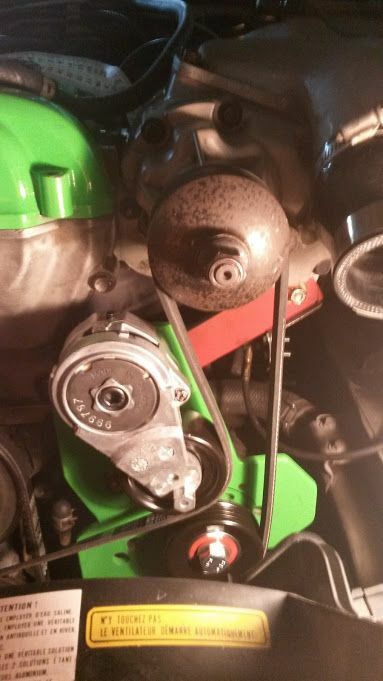 Can you place the tensioner on top and move the metal bearing down where the tensioner is? If that works I like that plate. Can you reproduce that? Sort of. Here is round 2. Not sure if this is enough wrap or not. I may end up making a new plate with the 4-rip static idler further out to the right and a smooth idler above it to increase wrap. New belt should be in tomorrow and we'll see what happens when I unlock the tensioner... I will have every belt from 40-55 inches in 1" increments by the time this is over. Make it work and I will be first in line to buy a plate from you. Someone is suggesting I put it on the wrong side - "tight side" vs "loose side" due to the direction of rotation of the belt. In one of your other pics it looked like you have done a coolant reroute. If that's the case then you likely can (or did) eliminate some of the hoses and clutter that the auto-tensioner location can conflict with. This might be something to keep in mind if you were making one for someone without the same clearances. 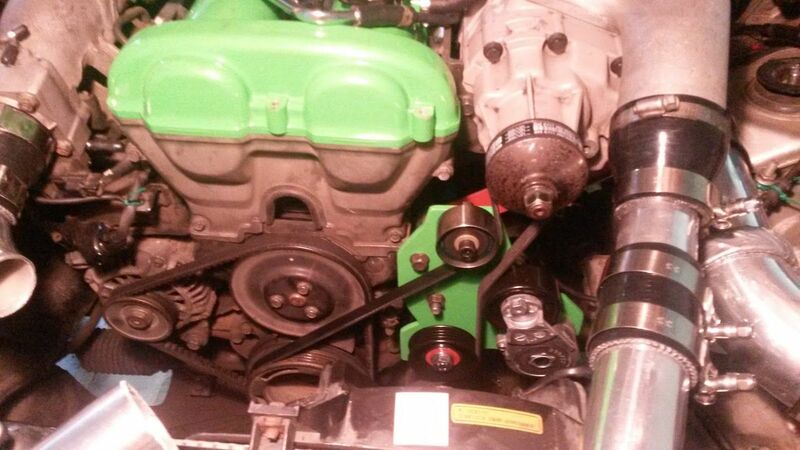 You mention that you haven't unlocked the tensioner and that you are getting shorter belts. This is good, because the way it looks in that pic above, it is likely that the swing of the tensioner arm will have a somewhat limited ability to adsorb the slack. Ideally, the motion the arm should be approximately perpendicular to the path of the belt. However, if the tensioner's range of motion starts in a deep saddle like that, it can lose too much of its total range to movement that is parallel to the belt path, leaving far less for slack absorption. In the worst case, it just moves the saddle from left to right without making it get any deeper (tighter). I like the idea of a small idler tucked up under the SC pulley to maintain good wrap, and then the tensioner working between it and the crank pulley. Keep in mind the size of the SC pulley (EDIT: and crank pulley) you will be using eventually. Shrinking the size of the SC pulley to increase pulley ratio (and boost) can reach a point of diminishing returns. You're asking a smaller contact patch of belt (because smaller pulley) to do even more work (compress more air). Another approach is to use a larger overlay pulley on the crank to change the pulley ratio instead, which preserves the existing SC pulley size and thereby maximizes your belt contact area (minimize belt slip). With that in mind, you might consider ensuring your auto-tensioner clearance/fitment if you should choose to go with a larger crank pulley. I MIGHT be able to add a static idler between the tensioner and the SC and rotate the tensioner ~45* CW if I can get a button head screw or maybe just a hex head with no washer (that the tensioner can swing over) to replace the lower mounting bolt. Will look into that. It may be important to add that static tensioner (w/out groove) as it will be where you can slide the belt easily in and out for maintenance. 50" belt seems to be working fine, just slips on when you pull the tensioner the whole way back. When you release the tensioner, it ends up in just about the position shown in the photo and in the early-middle part of its throw. Belt seems nice and tight. I will report back with any issues/updates. If you can make even a short video of it would be great. Also just a thought, would it be nice if you can add a pulley on the existing alternator pulley to make this one serpentine belt? It will be awesome kit. Sounds good. Have you changed the pulleys (upped the boost) at all yet? If and when you do, I would expect you'll need to keep a close eye out so that the tensioner doesn't push the belts together. Basically, when under greater loads (full boost, fourth gear, uphill, loaded car), you can expect even more belt stretch, and hence even more travel from that tensioner. Additionally, for initial sizing purposes with a new belt, you should always aim for fitment that is decidedly on the too tight side, as new belts always have some initial stretch even at modest boost levels. No, I'm not planning on changing any pulleys. It's a PT car so I'm already ballasting at this power level. Had some issues with my tensioner setup at the track when I experienced greater belt stretch than I was expecting. Here is the latest setup which seems to be working well. Yeah, I'm liking the looks of that a whole lot better. The tensioner is not in that deep saddle like it was before. If you need to ramp the belt grip up even more, you could put an small idler at about the 7:00 position under the compressor pulley, then relocate the tensioner to act between there and the crank pulley. 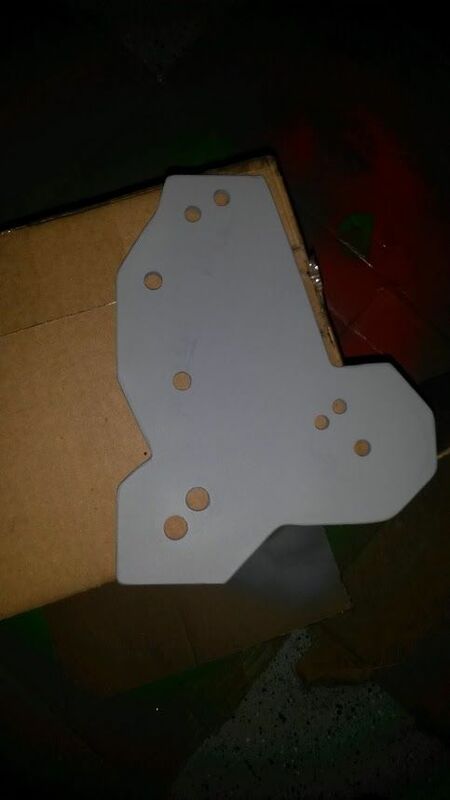 Of course you'd you'd probably have to remake your whole tensioner mounting plate then, so hopefully what you've got continues to be adequate. I picked up a used supercharger "kit" but I need a tensioner system for my non PS/AC car. Could you share your design file with me so I can build one for myself? It would be greatly appreciated! All times are GMT -4. The time now is 09:10 AM.